Classical TRIZ  (a Russian acronym; in English, "theory of inventive problem solving") was created by Genrich Altshuller between 1940 and 1960 . 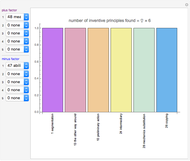 In this method for creating inventions, the inventive principles matrix is the core, while advantage (plus) and disadvantage (minus) factors let you navigate the matrix. This method has seen continuing development; for example, the TRIZ matrix was updated and improved by D. L. Mann [3, 4]. 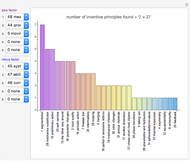 A traditional way of using the TRIZ matrix (e.g. 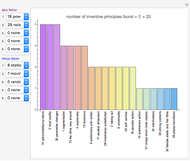 using a spreadsheet) is to choose a single input (one advantage factor against one single disadvantage factor). 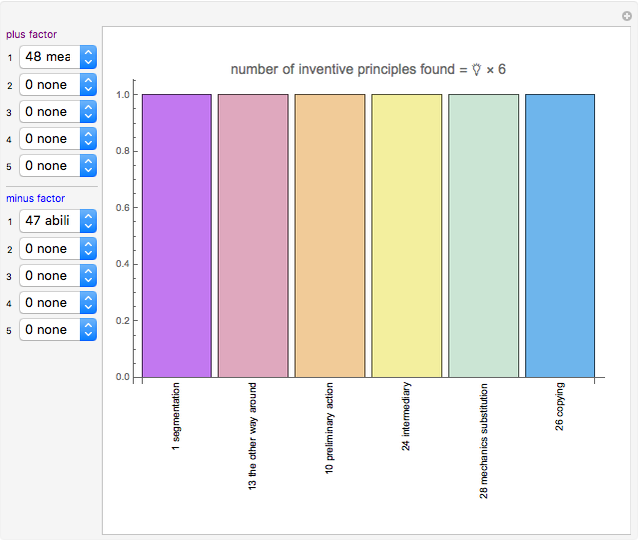 This Demonstration shows a new way by choosing multiple input parameters (advantage and disadvantage factors) to illustrate a statistical distribution for inventive principles. 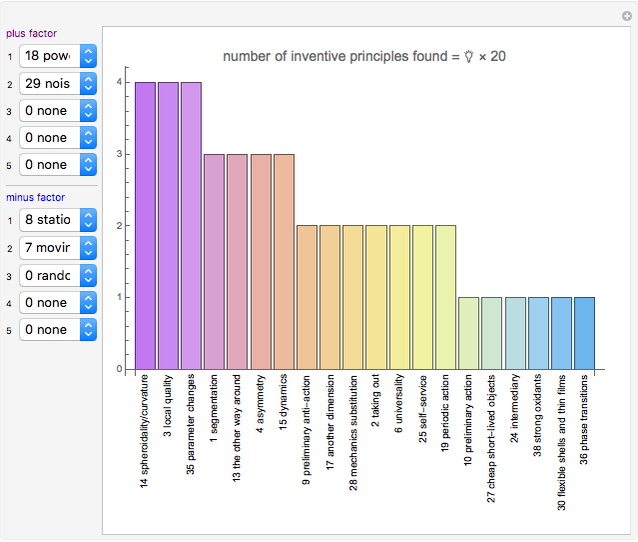 You may use it as a tool for looking for an inventive solution from the TRIZ matrix and 40 inventive principles. 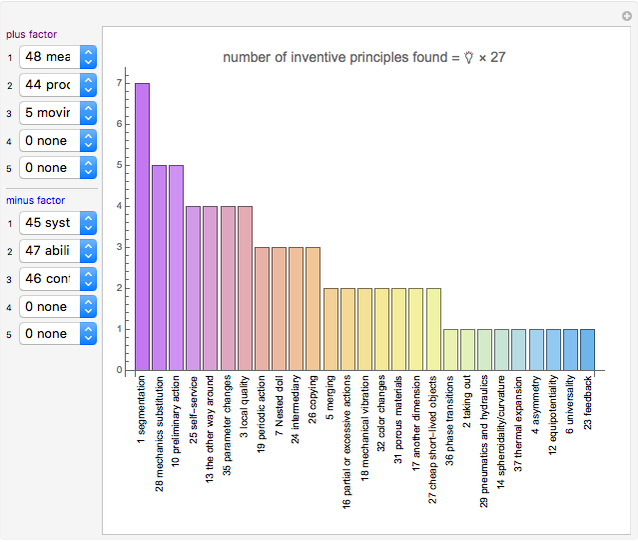 Mouse over each bar to show tooltips of the inventive principles. The source data is based on Mann's TRIZ matrix [3, 4]. This Demonstration uses the Mathematica function Tuples to generate all combinations between multiple advantage and disadvantage factors. Wikipedia. "TRIZ." (Sep 5, 2016) en.wikipedia.org/wiki/TRIZ. G. Altshuller, The Innovation Algorithm: TRIZ, Systematic Innovation and Technical Creativity (L. Shulyak and S. Rodman, trans. ), Worcester, MA: Technical Innovation Center, 1999. D. L. Mann, "Comparing the Classical and New Contradiction Matrix: Part 1—Zooming Out," The Triz Journal, 2004. triz-journal.com/comparing-classical-new-contradiction-matrix-part-1-zooming. D. L. Mann, "Comparing the Classical and New Contradiction Matrix: Part 2—Zooming In," The Triz Journal, 2004. triz-journal.com/comparing-classical-new-contradiction-matrix-part-2-zooming. L. Zheng, W. Fei and A. Bourov, "Learning TRIZ through Lithography-Electronics Co-evolution," in Proceedings of the 12th International MATRIZ Conference (TRIZfest-2016), Beijing, China (V. Souchkov, ed. ), Knoxville, TN: International TRIZ Association, 2016 pp. 188–197. www.triz-event.com/TRIZfest2016Proceedings.pdf. G. Retseptor, "40 Inventive Principles in Microelectronics," The Triz Journal, 2002. triz-journal.com/40-inventive-principles-microelectronics. Frederick Wu "Multiple Input Parameters for TRIZ Matrix Application"